Cheers! 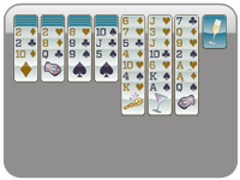 Ring in the New Year with these party-themed Solitaire cards. 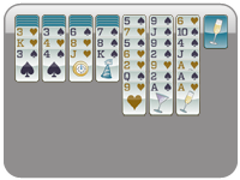 If you like a challenge, perhaps you can add, "Beat all 9 Solitaire games" to your list of New Year's resolutions! 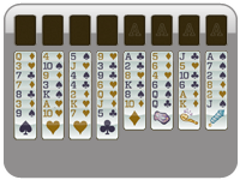 Start with the basic version of Solitaire - One Card Klondike - and build up to the more challenging games, Yukon, Scorpion, and Wasp! So, grab your bottle of champagne and your party hat, because these games will have your saluting the New Year right! 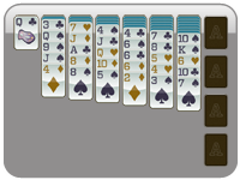 One Card Klondike is the simplest version of the classic Solitaire card game. 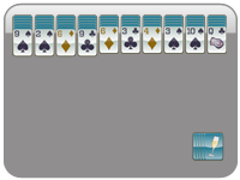 Using all four suits, you will create stacks in the tableau by moving cards around and building them in descending order (King to Ace), while alternating red and black cards. 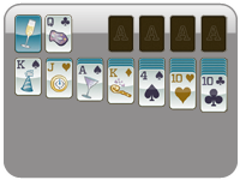 Start by finding all of your Aces, because the trick to winning the game is transferring all of your cards on the tableau to the foundation stacks in the top right corner. Build these by suit and in ascending order (Ace to King). Once all four foundations are complete, you win! 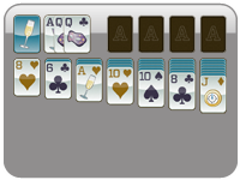 If you're stuck at any point in the game, click on the blue champagne card in the top left corner, and it will give you one card at a time to use in your tableau! This Solitaire game will give you a great foundation for playing the others, and you can have a mini New Year's celebration each time you win! Use the single stack card at the top if you need a little push!